S/Sgt Arthur Bell was my wife Margaret's father. Having survived the war he tragically died in 1953 slipping off his bicycle on an icy road, so sadly I never met him. Recognise the location? 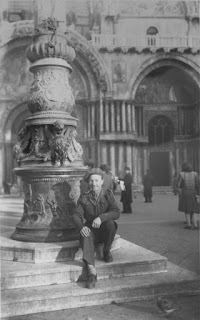 The photo is endorsed This photo was taken at 2pm Sunday 6th January 1946 at Piazza San Marco, Venice, Italy. At the time S/Sgt Bell was serving in Trieste. I suspect that Ron was in the queue waiting to be photographed. Small world, isn't it? Memory: just how reliable is it? I have received a copy of Mass-Observation: Britain in the Second World War, just published by the Folio Society. Phillip Ziegler has written the Preface and some of his remarks are highly relevant, in my view, to all WW2 archives based on memories and recollections. It's rather long so I've popped it in the following Comment. An obituary in the Times earlier this week caught my eye and I started to do a little research on this larger than life character. I knew that my good friend Martin Sugarman would have known about him and sure enough Martin had previously written a fairly extensive biography which I now post on to this site. Click on COMMENTS for the full story.